BURRILL FAMILY. Last updated Jan .2019. Details of the Burrill family from the Grewelthorpe, Laverton & Masham area. Information taken from census records and other Parish records. Thanks to C.Metcalfe for additional information and photos of graves. To the best of my knowledge the information given below is correct, however some items have been added from other contributors and I cannot vouch for these items. Do check if you are unsure. Kris & Ron Burrill in USA are looking for descendants and connections to Burrill, Burniston, Fryer & Umpleby families. Also interested in Aveyard, King, Calvert & Cundall families. Mary Randles is seeking information about the Bayles family. Mary Jane Bayles married William Burrill of Dallowgill. For full details see First page of Genealogy section. ADA BURRILL. Born C.1906 Carlsmoor. dau. of Leonard Peter & Mary Jane Calvert. ADA BURRILL. Born 25 Jan 1907 Dallowgill. Dau of Peter Leonard & Mary Margaret Almack. Unmarried in 1939 living Dallow Hall with Mother. ANN BURRILL. Born 22.9.1745. Died after 1807. Dau of John & Elizabeth Burniston. ANNE BURRILL. Born 1778. Died 1835. Dau of William & Sarah Temple. ANN BURRILL [Nee ?]. Born C. 1823 Harrogate. Mother of Charles Henry. ANNIE BURRILL. Born C 1866 Masham. Dau of Mary of Masham. Living 9 The Crescent. Masham 1891. In 1911 she was managing director & Proprietor of a steam laundry in Harrogate. ANNIE BURRILL. Born C. 1892 Dallowgill. Dau of Peter Leonard & Mary Margaret Almack. CHARLES BURRILL. Born 1801. Died 20.7.1802.Masham.Son of Joseph & Lucinda Wrather. M.I. St. Marys Church, Masham. CHARLES BURRILL. Born C.1864. Masham. A lodger at a boarding house in Easington 1891. CHARLES HENRY BURRILL. Born C.1868 Harrogate. Son of Ann of Harrogate. Married to Ellen of Keswick. [b.1869]. CLARA BURRILL. Bap. 30.10.1898. Buried 30.3.1978 Grewelthorpe. Dau of John William & Margaret Ellen King. CONSTANCE BURRILL. In 1713 she had a business weaving mine kibbels out of oak strips. She sold them to colliers on Colsterdale. [A kibbel is a large wooden bucket used for conveying ore and debris to the surface]. DORA BURRILL. Bap. 3.4.1892 Dallowgill. Dau of William John & Kate King. Married George Chandler on 3. 6 1919 lived at Bowes Farm Dallowgill. ELLEN BURRILL [Nee ?]. Born C.1869 Keswick. Wife of Charles Henry of Harrogate. ELLEN BURRILL. Born 1775. Died 1856. Dau of William & Sarah Temple. ELIZABETH BURRILL [Nee Burniston]. Born 4.11.1699.Grewelthorpe. Died 31.12.1784 Kirkby Malzeard. Dau of Leonard Burniston & Sarah Clarkson. Married to John in 1718 in North Leighton. Had 9 children. See also Burniston page. ELIZABETH BURRILL. Born 15.11.1738 Swetton. Died after 1807. Dau of John & Elizabeth Burniston. ELIZABETH BURRILL. Born 1763. Died 1834. Dau of William & Sarah Temple. ELIZABETH ALICE BURRILL. Born C. 1806 Redmire. Widow living College Lane, Masham 1891. ELIZABETH BURRILL. Married to Rev. Wm. Glaister. Dau of Joseph & Lucinda Wrather. of Masham. ESTHER BURRILL. Born 1788. Died 1863. Dau of William & Sarah Temple. EVA BURRILL. Born C.. 1901. Died 28.4.1980 Kirkby Malzeard. Dau of Leonard Peter & Mary Jane Calvert. Sister of Leonard. GEORGE BURRILL. Born 1636 Died 1718. Son of Thomas & Jane. 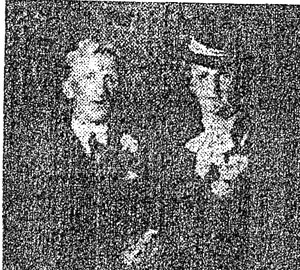 Married Margaret Oliver. GEORGE BURRILL. Born C. 1894. Son of Peter Leonard & Mary Margaret Almack. GEORGE BURRILL. Born 6 Feb 1895. Dallowgill. Dairy Farmer at Lowlands Farm Bedale in 1939. Widower. HANNAH BURRILL. Born C. 1830 Stonebeck Down. Servant at Coville Houses, Ramsgill, Pateley Bridge. 1851. IRENE CLARA BURRILL. Born 8.6.1926. Bap. 1.8.1926 Dallowgill. Dau of John & Clara of Wakehill, Dallowgill. Married CYRIL H.HUTCHINSON. in 1947 at Dallowgill. See photo at end. JAMES BURRILL. Born C. 1826. Died 23.11.1861 Liverpool. Buried Anfield Cemetery. M.I. St. Marys Church Masham. Son of John & Ann . See photo of Masham headstone at end. JANE BURRILL. Married 27.4.1710 Kirkby Malzeard to Richard Parker. JANE BURRILL [Nee Cundall]. Born C1805. Buried 5.9.1888 Dallowgill. Wife of William of Carlsmoor. JANE BURRILL [nee UMPLEBY]. Born C. 1828 Coverdale.Bap. 1.7.1827. Died 1900. Dau of Leonard Umpleby & Jane Bradley. Wife of John of Laverton. JANE BURRILL. Born C. 1846 Bedale. unmarried 1891. Dau of Elizabeth A. of Redmire. JANE [JENNY] BURRILL. Bap. 20.9.1894 Dallowgill. Died 3.1.1937 Carlesmoor. Dau of Leonard Peter & Mary Jane Calvert. Doing dairywork on family farm in 1911. JOHN BURRILL. Born 1666 Leighton. Died 1728 Kirkby Malzead. Son of George & Margaret Oliver. Married Mary Smith. 24.5.1688. JOHN BURRILL. Born C. 1693.Masham. Died 22.8.1760. Colthouse. Swetton. Son of John & Mary Smith. Married in 1718 at North Leighton to Elizabeth Burnistan.[Burniston]. [1699-1785] M.I. Kirkby Malzeard. He had 9 children. JOHN BURRILL. Born 1724 Leighton. 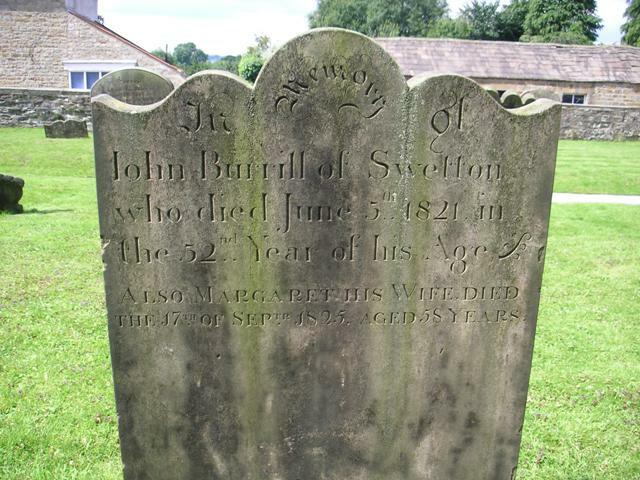 Died 3.10.1819 Swetton. Kirkby Malzeard. Buried 6.10.1819. Son of John & Elizabeth Burniston. JOHN BURRILL. Born 1767 Died 1819. Son of William & Sarah Temple. JOHN BURRILL. Born C. 1770. Lived Dallowgill. Buried 7.5.1821. Kirkby Malzeard Par. Reg. JOHN BURRILL. Married on 13 Nov 1798 at Kirkby Malzeard to Margaret Teasdale. JOHN BURRILL. Born C1798. Died 14.6.1846. Masham. Son of Joseph & Lucinda Wrather. Married Anne Blackburn. on 26.9.1826. Dau of James. M.I. St. Marys Church Masham. See photo of grave at end. JOHN BURRILL. Bap.5.1.1804 Laverton. Buried 5.10.1891 Dallowgill. Son of William & Margaret Cundall. Married Mary Fryer. on 13.5.1828 in Kirkby Malzeard. Living Potter Lane House, Laverton 1851. Living Bents House, Laverton 1871. JOHN BURRILL. Bap. 20.10.1828 Swetton, Laverton. Son of Peter Burrill & Susannah Cundall. Farmer living Swetton, Laverton in 1891. Married Jane Umpleby.[b. 1828] of Carlsmoor on 4.9.1854. at Kirkby Malzeard. Had 5 children. Wm John. John Wm. Leonard Pter. Robert Henry & Peter Leonard. Buried 23.7.1904 Dallowgill. JOHN BURRILL. Born C. 1842. 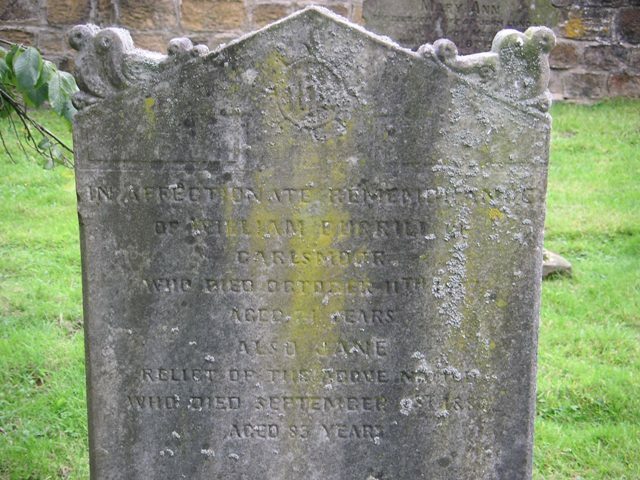 Died 11.9.1871 Masham. M.I. St. Marys Church, Masham. Son of John & Ann. See photo of grave at end. JOHN WILLIAM BURRILL. Bap 3.10.1852 Dallowgill. Son of Sarah Burrill. dau of John & Mary Fryer. Buried 28.6.1853 infant. [Ref. Par.Reg]. JOHN WILLIAM BURRILL. Bap 3.10.1858 Swetton. Died 25.10.1936 at Lady Hill Dallowgill. Son of John & Jane Umpleby of Swetton, Laverton. In 1887 Married Margaret Ellen King. sister of Kate King. See Kate Burrill. M.I. Dallowgill churchyard. Parish Councillor & Church Warden. Farmed for 40yrs. JOHN ROBERT BURRILL. Born C. 1861. 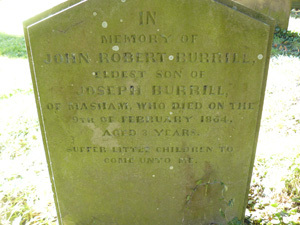 Died 9.2.1864 Masham. M.I. St Marys Church. Masham. Son of Joseph. See photo of grave at end. JOHN BURRILL. Born 12 March 1897 Dallowgill. Son of Peter Leonard & Mary Margaret Almack. Married to Clara [born 1897]. Living Wakehill Dallowgill in 1939. JOHN BURRILL. Born C. 1919. Buried 12.3.1968. M.I. Grewelthorpe churchyard. Husband of Clara. JOHN WILLIAM BURRILL. Born. 23.11.1930 Dallowgill. Bap. 21.12.1930. Son of John & Clara of Wakehill, Dallowgill. JOSEPH BURRILL. Born 11.4.1730. Swetton. Died 23.10.1806. Masham. Son of John & Elizabeth Burniston. Married to Elizabeth who was born 1735. Died 29.10.1810. Masham. M.I. St. Marys Church, Masham. Left an only son Joseph 1764-1853. JOSEPH BURRILL. 1782 Enclosure awards. Land at Low Moor, Nutwith Side. 1 acre, 0roods, 2 perch. JOSEPH BURRILL. Born C1796. Died 22.3.1830 Masham. Solicitor. Son of Joseph & Lucinda Wrather. JOSEPH BURRILL. Died 8 January 1872. Owned Bush Farm Grewelthorpe, also farms at Bridge Hewick, and Masham. He was a Gentleman. JOSEPH BURRILL. Born C.1871 Bridge Hewick. Son of Mary of Masham. Living 9 The Crescent, Masham 1891. Locomotive engineer apprentice in 1891. KATE BURRILL [nee King]. Born 29 Dec.1872. Thorpe Grange Grewelthorpe. Died 8.12.1961. Dau of John King. & Ann Cundall. of Lady Hill Dallowgill. Wife of William J. Burrill. Living with John at Swetton Farm Laverton in 1891. M.I. Chapel of Resurrection Dallowgill. KENNETH G. BURIILL. Born 14 Nov.1923. Son of George of Bedale. LENA BURRILL. Born. 29.6.1926 Dallowgill. Dau.of Leonard & Nellie of Carlesmoor. Wife of Henry Harrison. 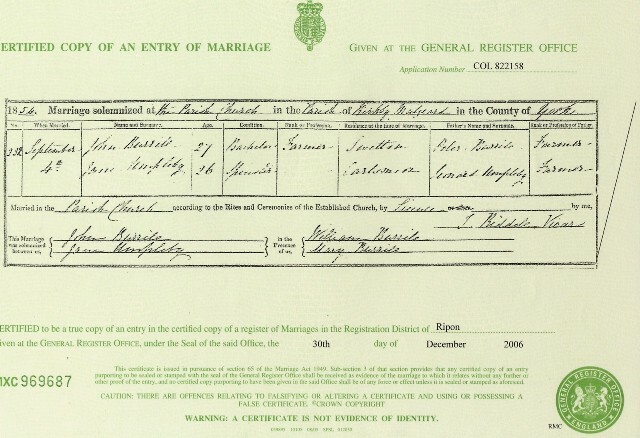 Married Grewelthorpe 1949. LEONARD BURRILL. Born C. 1726. Died 18.1.1808. Lived Swetton. Son of John & Elizabeth Burniston. Husband of Mary. M.I. Kirkby Malzeard. LEONARD PETER BURRILL. Bap. 22.4.1860 Laverton. Son of John & Jane Umpleby. Married Mary Jane Calvert. of Grewelthorpe in 1869. Had 7 children. Farmer of Carlsmoor, Grewelthorpe in 1891. LEONARD BURRILL. Born 27 Dec 1897. Dairy Farmer at Carlesmoor. Married to Nellie [born 1904]. LEONARD BURRILL. Bap. 13.11.1898 Dallowgill. Died 8.4.1975 Kirkby Malzeard. Son of Leonard Peter & Mary Jane Calvert. LEWIS BURRILL. Born 30 Jan 1891 Bradford. Son of John William & Margaret Ellen King. Married Winifred Hannah [Born 1891]. Died 2.1.1974 Kirkby Malzeard. In 1939 Dairy farmer at Lady Hill farm. LEWIS BURRILL. Born 12 August 1927. Died 18 Feb 2018 Dallowgill. LILIAN BURRILL. Born 29 April 1931. Married ? Chandler. LILY BURRILL. Born C. 1904. Dallowgill. Dau of Peter Leonard & Mary Margaret Almack. LUCY BURRILL. Born C.1883 Ripon. Dau of Thomas Other Burrill & Emily. MARGARET BURRILL. Bap. 4.10.1829 Dallowgill. Dau of John & Mary Fryer. Married  John Calvert. 5.6.1852.Kirkby Malzeard church. Witness Mary Burrill. Had dau. Mary. Married  Joseph Moore. had 7 children. MARGARET E. BURRILL. Born 18 Oct. 1866. A widow at Lady Hill. in 1939. MARGARET BURRILL. Bap. 16.1.1898 Dallowgill. Dau of William John & Kate King. MARJORIE E.BURRILL. Born 26 May 1927. Dau of George of Bedale. Married ? Fryatt. MARTIN BURRILL. Bap. 5.8.1888. Dallowgill. Son of John William & Margaret Ellen King. Buried 6.12.1893 in Dallowgill having lived in Bradford. MARY BURRILL. Born 1723. Died 7.1.1804 West House. Dau of John & Elizabeth Burniston. MARY BURRILL Born 1760. Dau of William & Sarah Temple. MARY BURRILL [Nee Fryer]. Born C.1805 Kirkby Malzeard. Wife of John of Laverton [b.1804]. MARY BURRILL. Born C.1837 Masham. Widow in 1891. Living 9 The Crescent, Masham 1891. MARY BURRELL. Bap. 6.10.1858 Kirkby Malzeard. Illeg. Dau of Mary of Dallowgill. Kirkby Malzeard. Married to Peter Leo in 1888. Living Dallow Hall 1911. MARY BURRILL. Born 10 Oct. 1895. Living Laverton 1939 with Mary Richmond. MARY BURRILL. Bap 13.11.1898 Dallowgill. Died 5.5.1980 Buried Dallowgill. Dau of Leonard Peter & Mary Jane Calvert. MARY JANE BURRILL. Born C. 1899 Dallowgill. Dau of Peter Leonard & Mary Margaret Almack. MARY MARGARET BURRILL [nee ALMACK.] Born 5 April 1868. Died 7.9.1949. Wife of Peter Burrill of Dallowgill. M.I. A widow living Dallow Hall in 1939. NELLIE BURRILL. Bap. 30.10.1894 Dallowgill. Dau of John William & Margaret Ellen King. of Lady Hill. NELLIE BURRILL. Born 19.1.1923. Bap. 25.2.1923 Dallowgill. Dau of John & Clara of Wakehill, Dallowgill. NORA BURRILL. Bap 1.10.1891 Kirkby Malzeard. Died 26.8.1914. Dau of Leonard Peter & Mary Jane Calvert. Doing dairy work on family farm in 1911. PETER BURRILL. Born C. 1782 Swetton. Buried 22.10.863 Kirkby Malzeard. Son of Leonard & Mary Hebden. Married Susannah Cundall. 7.6.1827 Kirkby Malzeard. Parents of John & Mary. PETER LEO. BURRILL. Born 26.1.1865 Laverton. Bap 8.10.1865. Died 7.1.1933 at Dallow Hall. Son of John & Jane Umpleby. Husband of Mary Margaret [Polly] Almack. of Kirkby Malzeard in 1888. Living Bents Hse. Laverton in 1891. M.I. St. Peters Churchyard Dallowgill. Parents of Robert. Annie. George. John. & Mary Jane. Eva, Lily, Ada & William. Living Dallow Hall in 1911. PETER BURRILL. Born C.1911 Carlsmoor. Son of Leonard Peter & Mary Jane Calvert. PETER BURRILL. Born 2 May 1911. Son of Peter & Margaret Almack. Unmarried dairy farmer living Dallow Hall in 1939. RICHARD BURRILL. Born 15.6.1735 Swetton. Died 1795. Son of John & Eizabeth Burniston. RICHARD BURRILL. Born 1781. Died 1868. Son of William & *Sarah Temple. ROBERT HENRY BURRILL. Bap. 11.1.1863 Swetton. Laverton. Died 1876. Buried 10.10.1876 Dallowgill. Son of John & Jane Umpleby. ROBERT BURRILL. Born 9 Dec 1881. Farm manager at Swetton Farm. 1939. unmarried. ROBERT BURRILL. Born C1890 Laverton.Died 14.3.1919 as result of WW1. Son of Peter L. & Mary M. Almack. M.I. St.Peters Churchyard Dallowgill. ROBERT V. BURRILL. Born 26 Nov. 1925. Son of George of Bedale. SARAH BURRILL. Born 9.12.1742.Swetton. Died 1832 Ringbeck. Dau of John & Elizabeth Burniston. SARAH BURRILL. Born & Died 1762. Dau of William & Sarah Temple. SARAH BURRILL. Born 1765. Died 1819. Dau of William & Sarah Temple. SARAH BURRILL. Bap. 10.6.1832 Dallowgill. Dau of John & Mary Fryer. Servant at Wakehill House, Laverton 1851. Had a son John William Burrill born 1853. Married on 8.2.1853 at Kirkby Malzeard to Timothy Bonwell. [b. 1830 Kirkby Malzeard] son of Timothy a Mason. THOMAS BURRILL. Born 1770. Died 1849. Son of William & Sarah Temple. THOMAS BURRILL. Born C. 1803. Died 11.9.1827. Son of Joseph & Lucinda Wrather. of Masham. THOMAS FRANK BURRILL. Born C. 1887 Masham. Son of Thomas Other Burrill & Emily. THOMAS OTHER BURRILL. Born C. 1843 Bedale. 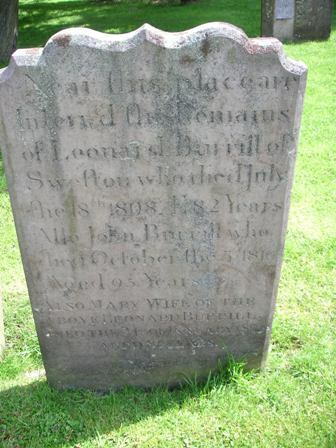 Husband of Emily of Boston Spa. Lived Belle Vue, Masham. Had 3 servants. WILLIAM BURRILL. Born 31.3.1733. Died 24.7.1813. Middlesmoor. Son of John & Elizabeth Burniston. Married 26.4.1756  Ann Hanley. Married 1.5.1759  Sarah Temple. of Middlesmoor. Had 12 children. WILLIAM BURRILL. Born C. 1769. Lived Dallowgill. Buried 9.6.1818. Son of William & Sarah Temple. WILLIAM BURRILL. Born about 1800 Masham. Lived Liverpool. Son of Joseph & Lucinda Wrather. WILLIAM BURRILL. Bap. 6.2.1813 Dallowgill. Died 11.10.1887. Buried Dallowgill. Son of William & Margaret Cundall. Married Jane Cundall. 26.4.1858 in Kirkby Malzeard. Farmer. Living Carlesmoor. 1851. WILLIAM JOHN BURRILL. Bap 6.6.1856 Dallowgill. Died 9.2.1905. Son of John & Jane Umpleby of Swetton Laverton. Husband of Kate King of Grewelthorpe. M.I. St. Peters Churchyard Dallowgill. Parents of Dora & Margaret. WILLIAM BURRILL. Born C.1869. Bridge Hewick. Sailor.Living 9 The Crescent Masham 1891. WILLIAM EDWARD BURRILL. Born C. 1889. Son of Thomas Other Burrill & Emily. WILLIAM BURRILL. Born 7.11.1908.Dallowgill. Son of Peter Leonard Burrill & Mary Margaret Almack. Married Mary Jane Bayles. 18.2.1939. Dairy farmer at Brim House Farm. Sawley. in 1939. Excerpt from The History & Antiquties of Masham & Mashamshire. The Register Books belonging to Masham Church commence 1599. The earliest book is in a delapidated state re. the binding but the leaves are preserved. A large portion of the Register was neatly re-copied by the late Rev. Joseph Burrill. [Vicar of Masham] at the expense of the Parish. 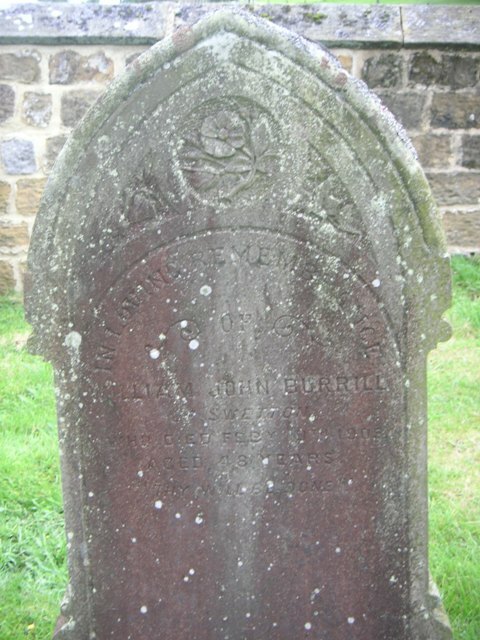 Grave of John Burrill 1798-1846. Son of Rev Joseph. Also of his wife Ann & Son John. St Marys Churchyard. Masham. Grave of John Robert Burrill. [1861-1864].Eldest son of Joseph Burrill. Grave of James Burrill. 1826-1861. 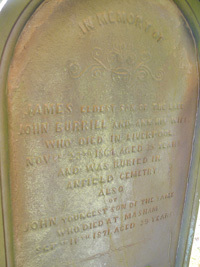 & John Burrill 1842-1871. Sons of John & Ann. St Marys Churchyard Masham. Grave of John William & Margaret Ellen Burrill at Dallowgill. Grave of Peter Leonard & Mary Margaret & Robert Burrill at Dallowgill. Grave of William & Jane Burrill of Carlsmoor. Dallowgill. Grave of William John Burrill at Dallowgill. 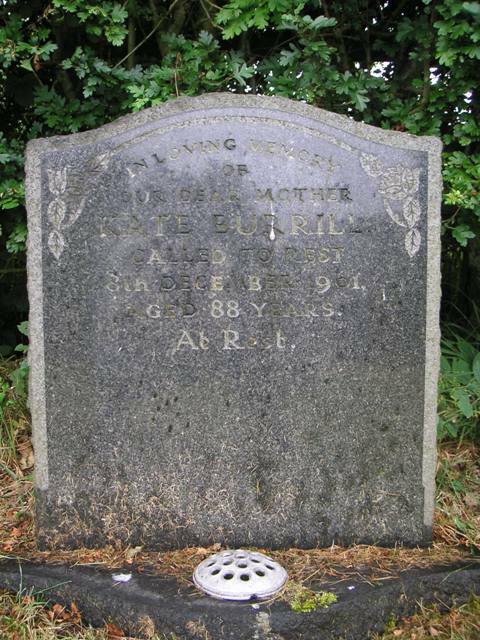 Grave of Kate Burrill. Church of resurrection Dallowgill. 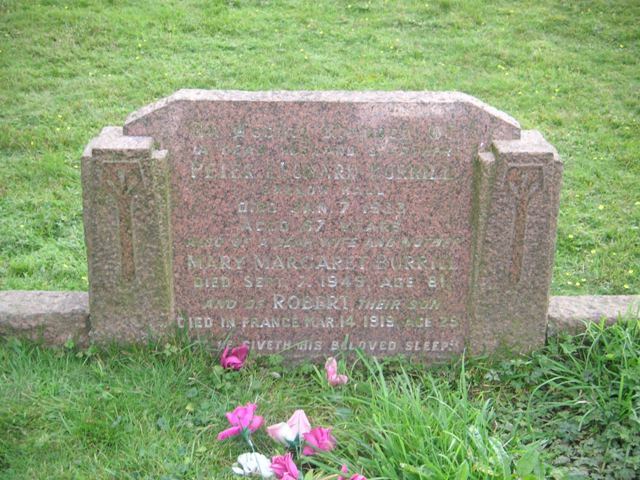 Grave of Leonard, John & Mary Burrill. Kirkby Malzeard. 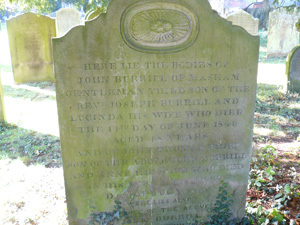 Grave of John & Margaret Burrill. Kirkby Malzeard. 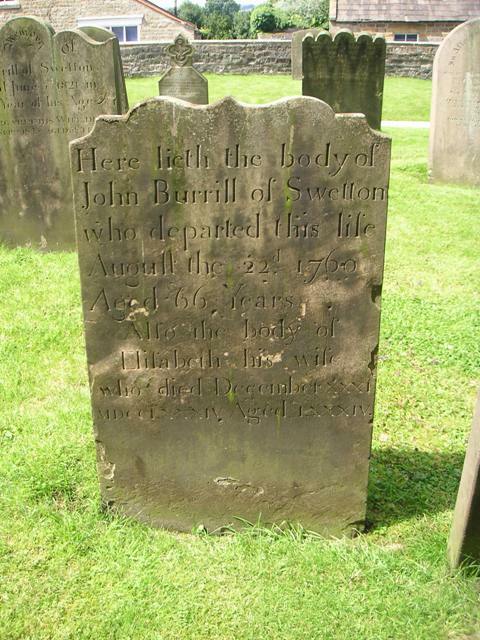 Grave of John & Elizabeth Burrill [nee Burniston]. Kirkby Malzeard. Marriage cert. for John Burrill & Jane Umpleby. Irene Burrill marries Cyril Hutchinson in October 1947. If you can add any information to this site please contact me.